Levi Stahl of The Seattle Review of Books says that SWINGING ON A STAR – THE WAR YEARS 1940-1946 is “compelling reading”. 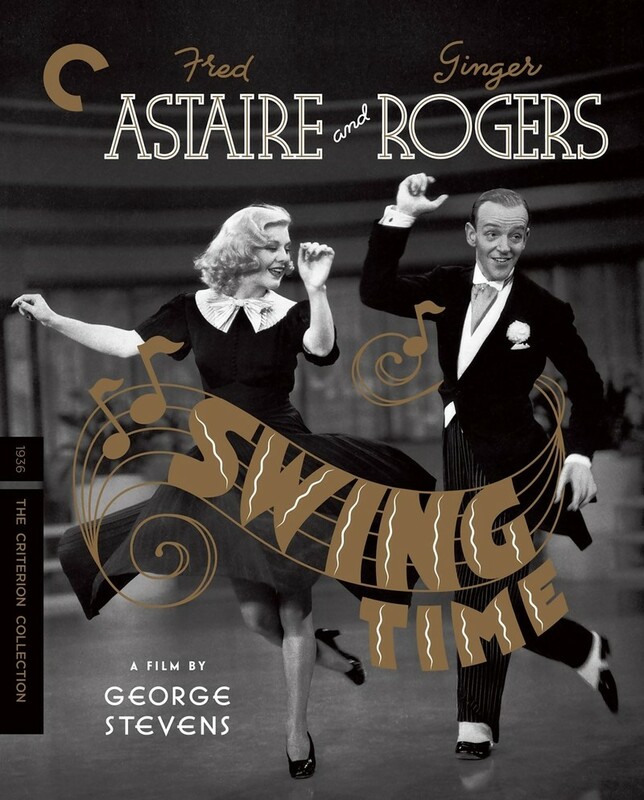 The Criterion Collection has announced a June blu-ray release of Swing Time, with an additional program, “In Full Swing”, with commentary by Gary. 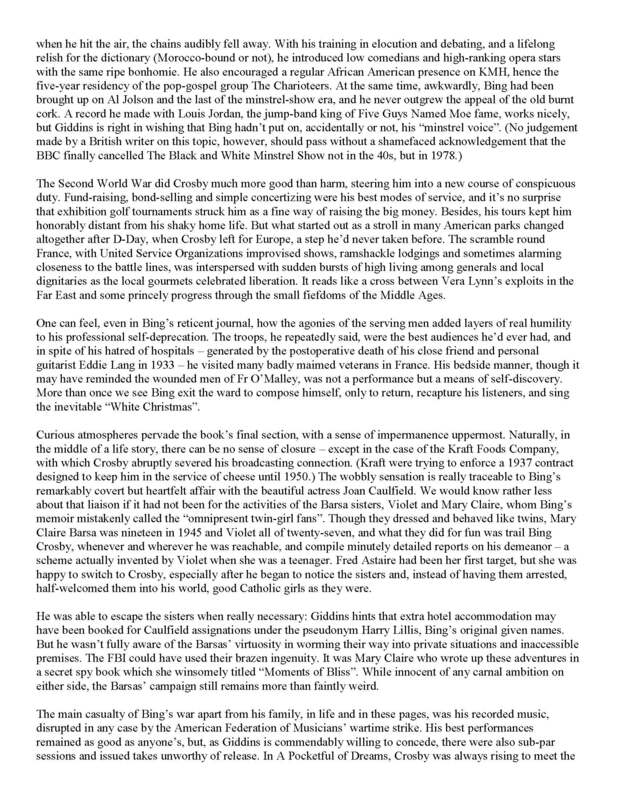 TV critic John Anderson reviews Bing Crosby: Swinging on a Star – The War Years 1940-1946 in America: The Jesuit Review. 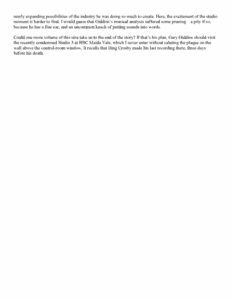 Film essayist David Bordwell has high praise for SWINGING ON A STAR – THE WAR YEARS 1940-1946 (scroll down a bit for “Bing & Bob’) – he also links back to another review he’s done on Gary’s work. The Criterion Collection released another in their fine series of remastered Blu-Ray Leo McCarey productions, The Awful Truth, featuring commentary by Gary Giddins. KSCO Santa Cruz radio host Gary Shapiro interviews Gary for From the Bookshelf (note: does not work with Google Chrome). The EWTN Network interviewed Gary about Bing Crosby: Swinging on a Star – the War Years 1940-1946 and Bing’s influence on vocations to the Roman Catholic priesthood. The Arkansas Democrat Gazette shares a list of recommended books from 2018, among them Bing Crosby: Swinging on a Star – the War Years 1940-1946. Buffalo News critic Jeff Simon says that Gary “… has done in two volumes now has been to create two-thirds of one of the greatest American showbiz biographies” in Bing Crosby: Swinging on a Star – the War Years 1940-1946. City Pages-Minneapolis lists the Year in Music Books, which includes Bing Crosby: Swinging on a Star – the War Years 1940-1946. Minnesota Public Radio’s “Rock & Roll Book Club”says that rock stars are still taking pages from Bing Crosby’s book today – from Jay Gabler. 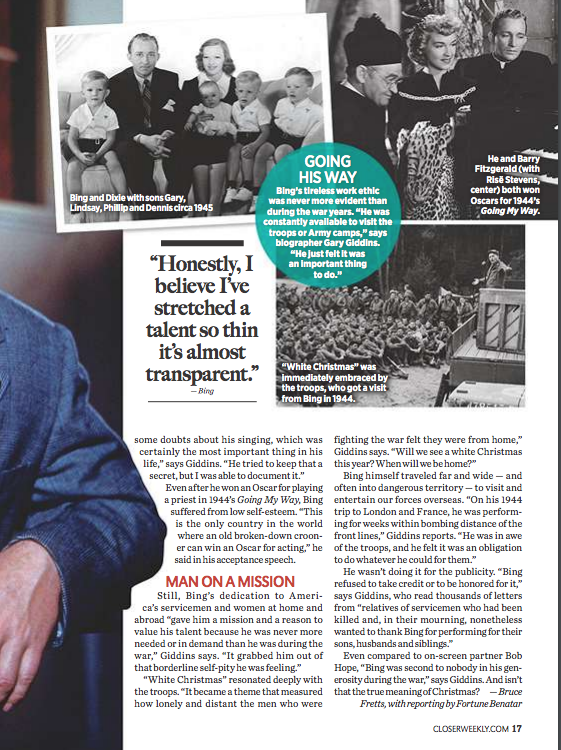 Closer Weekly shares their interview with Gary about Bing Crosby: Swinging on a Star – the War Years 1940-1946 in their magazine this month. Gary Giddins on Bing Crosby and Swinging on a Star – a conversation with Ted Panken. Gary, along with Kai Bird and Geoffrey C. Ward, discuss Bing Crosby: Swinging on a Star – the War Years 1940-1946 at CUNY Graduate Center on November 13, now on video. Gary’s presentation in Philadelphia on December 4 is available on video. 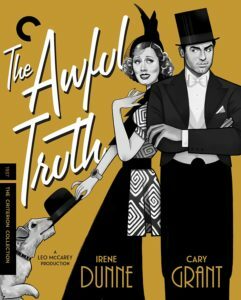 Gary is interviewed on NPR’s All Things Considered. The Pittsburgh Post-Gazette’s Rich Kienzle notes the complex, nuanced picture of a man in Bing Crosby: Swinging on a Star – the War Years 1946-1946. Bing shared a few ‘favorites’ lists in his day, and the Wall Street Journal discusses them, along with Bing Crosby: Swinging on a Star – the War Years 1940-1946. “Friend of Spokane” Gary Giddins and Bing Crosby: Swinging on a Star – the War Years 1940-1946, is at the top of the gift list in Spokane’s weekly newspaper, The Inlander. Bing Crosby: Swinging on a Star – the War Years 1940-1946 is one of the Best Arts & Entertainment Books of 2018 according to Kirkus Reviews. The Dallas Morning News is happy to review Bing Crosby: Swinging on a Star – the War Years 1940-1946. 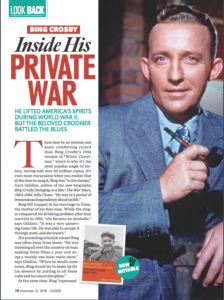 Publishers Weekly lists Bing Crosby: Swinging on a Star – the War Years 1940-1946 as one of the Ten Best Biographies of 2018. The Biographer’s Craft features an article (3rd down) about the November 13 CUNY Graduate Center Leon Levy Biography Center discussion about Bing Crosby: Swinging on a Star – the War Years 1940-1946. One of 11 New Books Recommended by the NY Times – Bing Crosby: Swinging on a Star – the War Years 1940-1946. Catholic News Service adds its praise for Bing Crosby: Swinging on a Star – The War Years 1940-1946. Jazz Times reviews Bing Crosby: Swinging on a Star – The War Years 1940-1946. Ten Things in the World to be Thankful For in 2018 – lucky #7 is Bing Crosby: Swinging on a Star – The War Years 1940-1946 from Foreign Policy Magazine. For the jazz lover on your holiday gift list from from WBGO-FM in NYC – Bing Crosby: Swinging on a Star – The War Years 1940-1946. 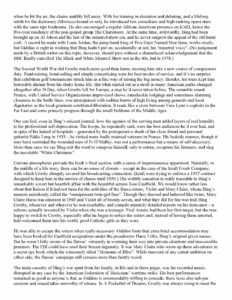 Bing Crosby: Swinging on a Star – The War Years 1940-1946 is reviewed in the Wall Street Journal. A starred review for Bing Crosby: Swinging on a Star – The War Years 1940-1946 from Booklist. 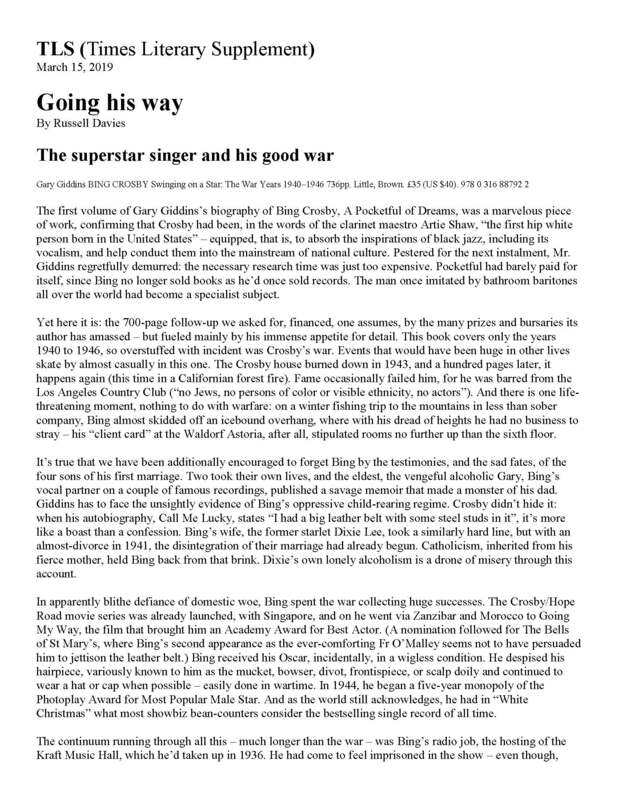 The Washington Post has a review of Bing Crosby: Swinging on a Star – The War Years 1940-1946. 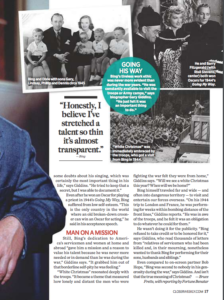 What to read this week from Newsday – Bing Crosby: Swinging on a Star – The War Years 1940-1946. Jazz Profiles gives their take on Bing Crosby: Swinging on a Star – The War Years 1940-1946. 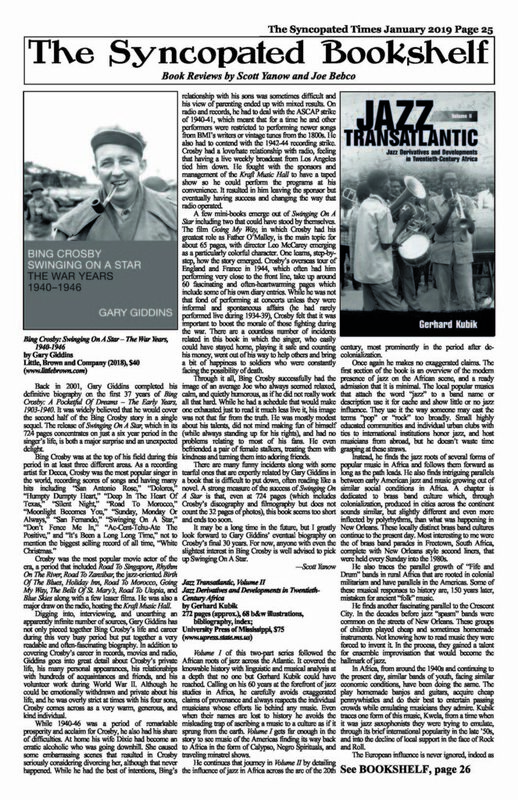 Gary is interviewed by Jerry Jazz Musician founder and publisher Joe Maita about Bing Crosby: Swinging on a Star – The War Years 1940-1946. 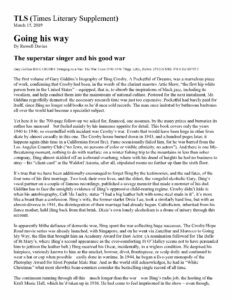 Spokane’s daily newspaper, The Spokesman Review, interviews Gary about Bing Crosby: Swinging on a Star – The War Years 1940-1946. The Spokane weekly newspaper, The Inlander, interviews Gary prior to his visit to Bing’s hometown. 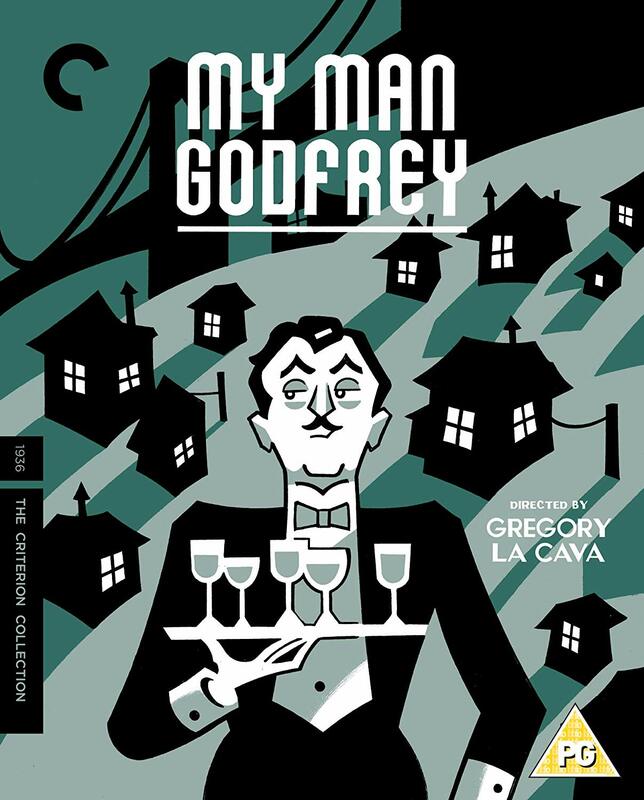 A blu-ray release of My Man Godfrey features commentary by Gary. 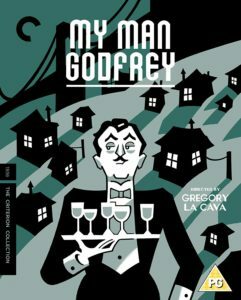 Fire Music film on free jazz features commentary by Gary. A starred review for Bing Crosby: Swinging on a Star – The War Years 1940-1946 from Kirkus Reviews. A starred review for Bing Crosby: Swinging on a Star – The War Years 1940-1946 from Publishers Weekly. 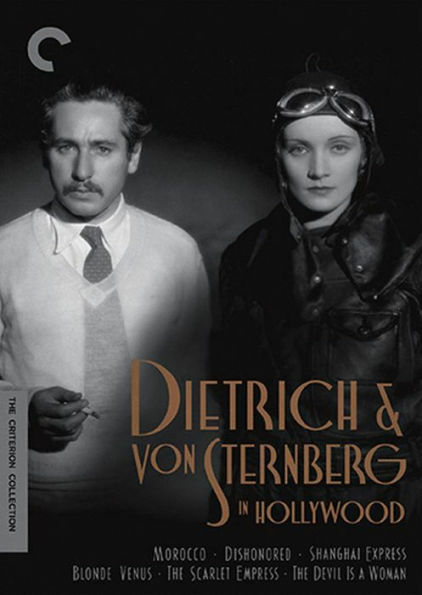 Gary has contributed an essay to the booklet accompanying this new DVD set from The Criterion Collection on the films of Marlene Dietrich. Mann was writing in 1900, when the Schoenberg scandal was just getting started and Buddy Bolden had yet to organize his first band. But, of course, nothing has changed. It is no fun to face the disbelief of friends, family and students when arguing the virtues of sounds that scrape against their nerves like jagged razors. Almost every jazz lover has had to confront that kind of incomprehension, whether defending against accusations of polyphonic chaos, swing-era compromise, bebop decadence or avant-garde fakery. Jazz is so isolated from the lives of most Americans that it is routinely written off as a citadel of snobbery. But who were we kidding, we Ornette-o-philes who attend every infrequent appearance, cheer every infrequent recording? Clearly, his music is resistible. I recall the jolt of first hearing him in the mid-’60s: “W.R.U.” on Ornette! In the jazz world, that album was old news, but in the civilian precincts of popular culture, it was more than a little terrifying and thoroughly intoxicating. Every time I thought I understood something about jazz, I came across a recording that humbled me into willing submission. Even so, this, more than Coltrane or Taylor or Dolphy, was utterly unlike anything in my experience—the brashness, the unbroken rhythm, the loopy fragmented melodies. Gunther Schuller’s liner notes provided several phrases that helped me to process the music—“innermost logic,” “sonority investigations,” “splintered lines” and, chiefly, motivic development as related to the masterpiece “R.P.D.D.” I took it as a personal gift from Coleman that he followed “W.R.U.” with “T. & T.,” a short piece that is all melody and drums—and that any dolt can understand. In return, I worked enthusiastically at taking in the long pieces, teaching myself to follow the improvisations in increments. It was like grappling with a hard novel or poem. Autodidacts live for these kinds of challenges. I would listen repeatedly to a few minutes of a solo until I knew that section, and then add a few more minutes and then a few more, until I could follow the solo in its entirety. In the course of trying to understand Ornette, I soon made the same breakthrough I had experienced with Charlie Parker, whose music seemed an incomprehensible rush of notes until one day I found myself absentmindedly singing one of his solos and realized it was all melody—fast, volatile and rhythmic, but melody all the same. Perhaps what I’m saying is that I loved Coleman before I liked him—love being harder to quantify but necessary to spur me onward. The homework you make for yourself is never work. 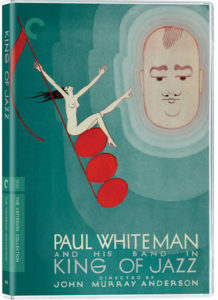 In high school, my peculiar obsession with jazz prompted a teacher to suggest I hold a seminar to talk about the music. I saved Ornette for last, as an example of the futuristic cutting-edge, figuring I would play a minute of “R.P.D.D.” so that my audience could hear the unmistakably brittle sound. To my surprise, they protested when I lifted the needle; they wanted more. The other day I played my daughter a couple of selections from Ornette’s new CD, Sound Grammar, which won’t get as much attention as Dylan’s very fine Modern Times but is every bit as great an event—for me, it is hands-down the record of the year. She instantly identified with the groove on “Turnaround” (initially recorded for 1959’s Tomorrow Is the Question!) and, though confused by shifts in dynamics, thought “Jordan” beautiful and moving. But she soon lost interest, wanting to hear the rest some other time. Buddenbrook would love her and resent me. Yet I don’t see the need to choose: Render onto pop its quick-fix pleasures, but render unto art the rewards of effort and empathy. 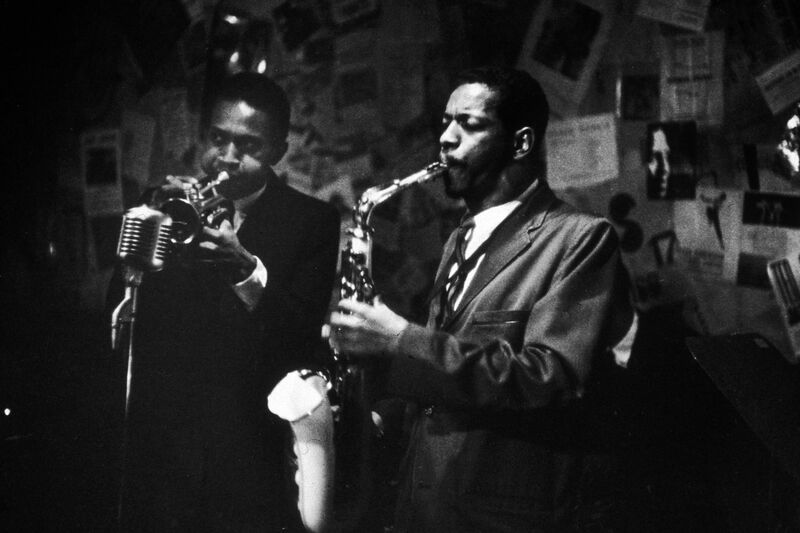 Art Blakey, recasting Picasso, observed that jazz washes away the dust of everyday life. Ornette washes it away with an astringent. He clears the palette, neutralizes prejudices and begins at the beginning. I don’t know how many times I’ve seen him over the past four decades, yet his music always invigorates me—every performance, without exception. In this I am not alone. The classical composer Hale Smith felt the same way, and once suggested that we responded the way we do because of Ornette’s quarter-note pitch, which instantly raises his performance to an inimitable, matchless plateau—like visiting a much-loved city. An indication of Coleman’s genius is that Sound Grammar provides as thrilling and timeless an entry into his music as the most revered of his old classics. University of Minnesota Press announces a FULLY REVISED edition of Celebrating Bird: The Triumph of Charlie Parker, by Gary Giddins, available September 2013! “The Bing Crosby CBS Radio Recordings 1954-56” – from Mosaic and Bing Crosby Enterprises, with liner notes by Gary Giddins. Gary talks about Warning Shadows – May 19, 2010. W.W.Norton’s Featured Author: Gary Giddins – Oct 24, 2009 Gary Giddins is W. W. Norton’s featured author as they proudly announce the trade edition of “Jazz”. Five-Star Review for Jazz – from Time-Out New York. Jacketing Music – Vintage Magazine’s inaugural issue.